When we love someone, we can't imagine living a single day without them. Leonard and Hazel Cherry were a pure case of this. 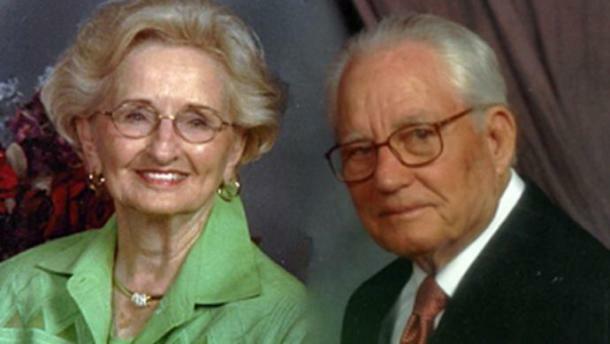 The two died just 10 hours apart after 74 years of marriage. Their love story is simple: Leonard and Hazel met and fell in love in high school, married in 1942, and had been inseparable ever since. Aside, of course, for the time Leonard had served as a B-24 bomber pilot in World War II. After the war, the couple opened an auto repair business in Fort Worth, Texas, which the two of them worked for almost 40 years. They gave up their shop so they could live closer to their son and grandson in Woodson, Texas, the city where they spent the rest of their lives together in. According to their only son, David Cherry, 72, his parents were absolutely ideal together. He explained: "Even at 95 years old, still, when he talked about her, he had a sparkle in his eye." Leonard had been in hospice care during the final days before his death, and Hazel had moved into the nursing home next door. After just a few days, the couple passed on. Leonard had been in bad health for years, but Hazel, according to her son, had been quite healthy, still driving to the grocery store and the like. Hazel's death came as quite a surprise, for this reason. Sounds a little bit like The Notebook, doesn't it? At this time, David is going through the motions of accepting that both of his parents are gone, saying he "can't pick up the phone and call 'em anymore, or call mother. Can't go by and see Dad and just check on him ..."
Their only grandson, Craig Cherry, also regarded them as the strongest love he had ever seen. Despite their deep grief and mourning the loss of their family members, the Cherrys are happy that the couple is now together for eternity, as it should be. “The more I began to think about it, I began to smile because of how much they loved each other. There’s no question in my mind my grandmother was waiting for him in heaven with open arms,” David Cherry told KWTX. We are just happy that they enjoyed a lifetime of love that can inspire us all.